Only three species of wombat survived the Pleistocene to modern times, i.e. the last 10 000 years. These three modern species were probably quite widely distributed at the time of European settlement, 200 years ago, but reliable records are few. The southern hairy-nosed wombat (Lasiorhinus latifrons) (Figure 1.5a and Plate 2) was then distributed from the eastern corner of Western Australia across South Australia to the Murray River. Its close relative, the northern hairy-nosed wombat (Lasiorhinus krefftii) (Figure 1.5b and Plate 1) was still present in northern Victoria and southern New South Wales as well as in south-eastern Queensland, but fossil records show that it had been much more widespread during the late Pleistocene. The bare-nosed wombat (Vombatus ursinus) (Figure 1.5c and Plate 3) occupied a stretch of country from south-eastern Queensland, through New South Wales along the Great Dividing Range and associated ranges to Victoria, where it was spread over most of the state except the northwestern corner. It was also present in the south-east of South Australia, in Tasmania and on many of the larger Bass Strait Islands. 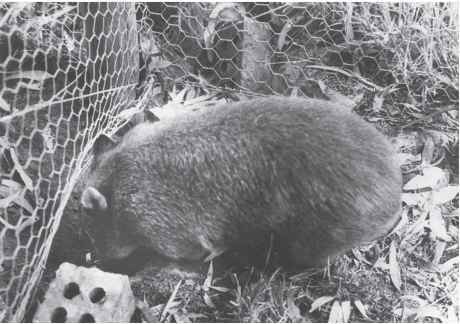 Figure 1.5 The three species of wombat: (a) southern hairy-nosed wombat (Photo: C Marks), (b) northern hairy-nosed wombat (Photo: A Horsu p), and (c) bare-nosed wombat. It is about the size of a badger, a species of which we supposed it to be, from its dexterity of burrowing in the earth, by means of its forepaws; but on watching its general motions, it appeared to have much of the habits and manner of a bear ... This animal has lately been discovered to be an inhabitant of the interior of this country also . The mountain natives call it Wombach. We saw several sorts of dung of different animals, one of which Wilson called a Whom-batt, which is an animal about 20 inches high, with short legs and a thick body with a large head, round ears, and very small eyes, is very fat and has much the appearance of a badger. This was the first description of a wombat by a European, and it seems extraordinary that our early settlers had been in the colony for 10 years before recording one. Wombats had, however, long ago adopted a semi-nocturnal existence, and the early colonists had little incentive or, in the case of convicts, little opportunity to wander at night in this unfamiliar land of shrieking possums, hostile natives and other unknown hazards. At first, the discovery of Australia's strange and exotic animals caused a flurry of interest, and many specimens were sent back to England for the zoologists to examine. But for the colonists, life was a grim battle as they set about the task of clearing the land for crops and for better pastures for their sheep and cattle, and they had little time to be sentimental about the animals whose land they were altering so irrevocably. Although they found that some were edible - wombat hams and kangaroo steaks often supplemented scanty food supplies - and that many provided skins which could be sold or used for rugs and clothing, they generally thought of all the native animals as pests. 'If it moves, shoot it' seems to have been the general rule. The southern hairy-nosed wombat was not discovered until the middle of the 19th century, when colonies were found in South Australia west of the Murray River. It had been described from a skull in 1845 by Richard Owen, a British researcher who in 1872 also described the northern hairy-nosed wombat from a skull sent to him by a German zoologist, Johann Krefft, who collected it, along with other fossils, from the Wellington Caves in New South Wales in 1869. It was not until 1884 that northern hairy-nosed wombats were found living at Moonie River near St George in southern Queensland and in southern New South Wales near Deniliquin. These populations became extinct early in the 20th century, but a population was found in 1937 in central Queensland near Clermont on a cattle property called Epping Forest Station.